When Valve officially announced their Steam Machines two weeks ago, they skimped a bit on the details—we know that there will be a wide variety of living-room-centric PCs, and we know they'll run the Linux-based SteamOS operating system, but we don't know much about specs, or prices, or options. Let's travel back in time. The year: 2013. The month: February. The place: Las Vegas. The scene: Valve boss Gabe Newell delivering the keynote at the DICE gaming conference. During his talk, Newell actually shed a lot of light on his company's long-term plans for the Steam Machine, and now that Valve's made the official announcement, we can give those remarks some more context. 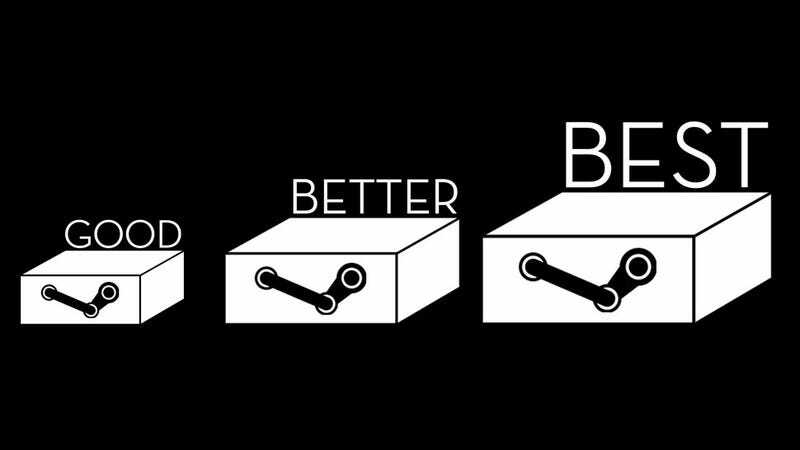 "We think there's actually gonna be a segmentation," Newell said, laying out three possibilities: Good, Better, and Best. "The good-better-best will relate directly to both pricing and functionality." Valve hasn't officially announced any of these Good, Better, or Best models yet, but looking back at what Newell said in February, we can figure out exactly what they'll be like. Let's break it down. Specs: Low-end machines, more akin to an extra monitor than an actual computer, according to Newell. The "good" machines will stream games to your television from your real PC, which does all the processing—the "heavy lifting"—from somewhere else in the house. This fits with what Valve said last month about SteamOS's streaming capabilities, and it also seems to be the company's solution for getting non-Linux games running on their Linux-based operating system: if it can't run natively, you're gonna have to stream it. Cost: "That's gonna start at about $100 and eventually go down to zero," Newell said. Specs: This is what you get if you want to replicate a next-gen console—the middle-end Steam Machines will compete with the likes of Xbox One and PS4, Newell said. Expect specs around that area. This machine of course won't have the Xbox and PlayStation's software exclusives, but it will be upgradable, and it will be a valuable soldier in the never-ending PC-vs.-console wars. Cost: Also comparable to consoles, Newell said—given that the PS4 is $400 and the Xbox One is $500, we're looking at what will probably fall into the $300-$500 range, depending what kind of models Valve offers. Specs: This is the hard stuff—"the sky is the limit," Newell said. We're talking luxurious, ultra-powerful PCs, much like the high-end prototype that Valve will send to a lucky 300 beta users later this year. Titan graphics cards, i7 processors—that sort of thing. Cost: Could be anything. "If you want a $4,000 living room box, I'm sure there are lots of PC vendors that are gonna send that to you," Newell said. More realistically, we're probably looking at a $1,000-$2,000 range, depending how Valve equips these machines. Our rough estimates, based on Valve's first Steam Machine prototype, place the highest-end box at around $1,850—and that's without the controller or whatever other mark-ups Valve adds to the beast. Granted, Valve's plans may have changed over the past eight months, but this sort of categorization fits with everything they've announced so far. We might see fancier names than Good, Better, Best, but we'll definitely see options. No Half-Life 3, though. We'll never see that.